HomeCelebsThe ‘Kalank’ trailer is out and we’re convinced it’s more than just a story of eternal love! With the release of this film just a few weeks away, promotions for ‘Kalank’ are in full swing. The makers of the film had ‘teased’ the audience with a teaser that was two minutes long just three weeks ago. After releasing three songs from the film that are on their way to becoming chartbusters, the makers finally dropped the film’s much-awaited trailer. Despite everyone’s expectations of a longer trailer, the two minutes, sixteen-second long trailer, piqued the audience’s interest and left them wanting for more. The trailer's 1.5 lakh views in less than an hour of its release serves as proof. 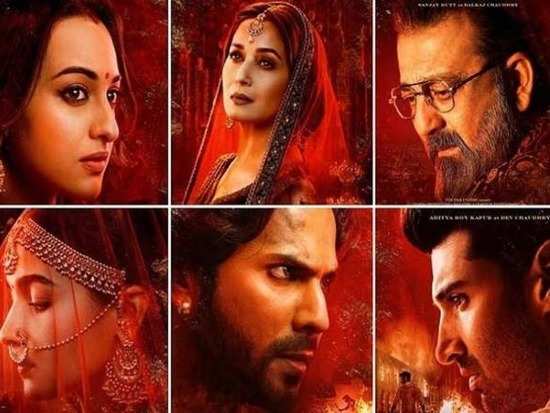 The film’s trailer went on to reveal layers of the film’s complex lead characters of Roop (Alia Bhatt), Zafar (Varun Dhawan), Dev (Aditya Roy Kapur), Satya (Sonakshi Sinha), Balaraj Chaudhry (Sanjay Dutt) and Begum Bahaar (Madhuri Dixit Nene) without revealing any important details of the story. Apart from the lead ensemble cast, we now know that Kunal Khemu and Kiara Advani will also have important roles in the film. With Roop marrying Dev and being in love with Zafar and Dev being already married to Satya, we now know ‘Kalank’ is more than just a complicated love-rectangle situation. The trailer goes on throw light on the disparity between the Hindu and Muslim characters in the film. It also revealed scenes depicting an act of communal violence. With the film set during the pre-independence 1945, something tells us the imminent partition of the two countries will play a huge role in the film’s story. For now, we’re thrilled with the bits and pieces of the story we already know and can’t wait to join the dots. Can you? Directed by Abhishek Varman and helmed by Karan Johar and Sajid Nadiadwala, ‘Kalank’ is all set to hit the theatres on April 17, 2019. Check out the larger than life trailer for yourself below! 1The ‘Kalank’ trailer is out and we’re convinced it’s more than just a story of eternal love!